Thunderstorms in Earth's upper atmosphere remain something of a mystery. Scientists cannot reach them directly with instruments; they are too high for balloons and too low for weather satellites. Flying through thunderstorms or camping out on mountaintops waiting for one typically ranks low even on an adventurers' bucket list. An investigation aboard the International Space Station has come to the rescue. The European Space Agency (ESA) Atmosphere-Space Interactions Monitor (ASIM) is a collection of optical cameras, photometers and a large X- and gamma-ray detector mounted on the outside of ESA's Columbus Module on the station. For at least two years, it will observe thunderstorm-generated electrical discharges in the upper atmosphere – the stratosphere and mesosphere – up to the ionosphere, the edge of space. This Earth observation facility enables study of severe thunderstorms and their role in the Earth's atmosphere and climate. The space station offers this investigation an ideal observing platform for several reasons. Its low-Earth orbit brings the observations as close as possible to these upper-atmosphere phenomena. The station's orbit also offers almost complete coverage of tropical and subtropical regions, much of which are difficult to access but are where some of the most intense thunderstorms form. Finally, observations are made in optical bands that are subject to absorption in the atmosphere and so cannot be used for ground observations. Sprites are flashes caused by electrical breakdown in the mesosphere. Blue jets are lightning discharges reaching upwards through the stratosphere, and elves are concentric rings of emissions caused by an electromagnetic pulse at the ionosphere's bottom edge. Giants are large discharges that create an electrical breakdown of the atmosphere from the top of thunderstorms to the bottom ionosphere. Terrestrial gamma-ray flashes are a flash phenomenon generated at the top of thunderstorms. Evidence suggests that run-away electron discharge causes some of these phenomena. In the 1920s, English scientist C.T.R. Wilson received a Nobel Prize for work with a cloud chamber that made visible the ionizing radiation from cosmic rays and X-rays. He predicted that electrical discharges can occur above thunderstorms in the mesosphere, and that thunderstorm electrical fields can accelerate electrons to relativistic energies. Instruments were not sensitive enough to provide a definitive answer until 1993, however, when flashes of X-rays over thunderstorms were observed from NASA's Compton Gamma Ray Observatory. 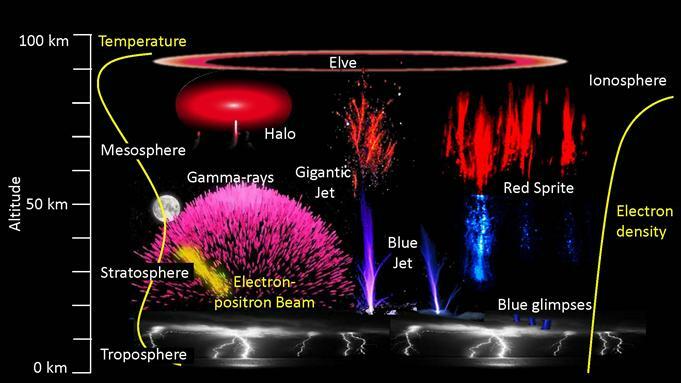 In 1990, the first observation of a sprite was documented, and since then ground and aircraft observations discovered a multitude of discharges above thunderstorms, and spacecraft in low orbit observed X- and gamma-ray radiation. ASIM represents a comprehensive global survey of these super-high altitude, difficult-to-observe-from-the-ground events to help determine their physics and how they relate to lightning. The investigation also studies high-altitude cloud formation and determines what characteristics make thunderstorms effective in disturbing the high-altitude atmosphere. The research improves understanding of the effect of thunderstorms on Earth's atmosphere and contributes to better atmospheric models and meteorological and climatological predictions. "High-altitude observation allows us to study these events without the obscuring clouds," said principal investigator Torsten Neubert of the National Space institute of the Technical University of Denmark. "With ASIM we will better understand the complex processes of upper-atmospheric lightning, which are also elements of ordinary lightning, although they take on different forms. This understanding can improve technology for detecting ordinary lightning." The investigation also helps clarify the effect of thunderstorms on the atmosphere, ionosphere and radiation belts, and will monitor the influx of meteors in Earth's environment and their effect on its atmosphere. Blue jets at the top of thunderstorm clouds, for example, change the concentration of greenhouse gases, another way thunderstorms can affect the stratosphere. The types of discharges and their structure help scientists better understand the structure of the atmosphere where they occur and of the thunderstorm battery that powers them. "We will learn more about thunderstorm clouds and more of the fine-structure of the stratosphere and mesosphere, of which little is known," Neubert said. Based on video taken by ESA astronaut Andreas Mogensen from the space station in 2015, scientists already learned more about what types of cloud create such activity, and that lightning comes from clouds at an altitude of about 10.5 miles (17 km). "These are solid scientific results documenting for the first time how active the tops of thunderclouds can be," he added. ASIM observations also improve understanding of the effect of dust storms, urban pollutants, forest fires, and volcanoes on cloud formation and electrification, and the relation of eye-wall lightning activity to intensification of thunderstorms. That could help us all live more happily ever after. For more information about current investigations happening aboard the space station, follow @ISS_Research. For opportunities to see the space station pass over your town, check out Spot the Station.